Having a stop in Miami, Florida for a day is not one of the more exotic ports of call one can have on a cruise boat. Especially since I’ve visited several times before. However, I’m not yet to the point where I will not disembark and explore whatever the port may be. Driving along the highway and bridges into the Florida Keys, we saw a mess of iguanas. 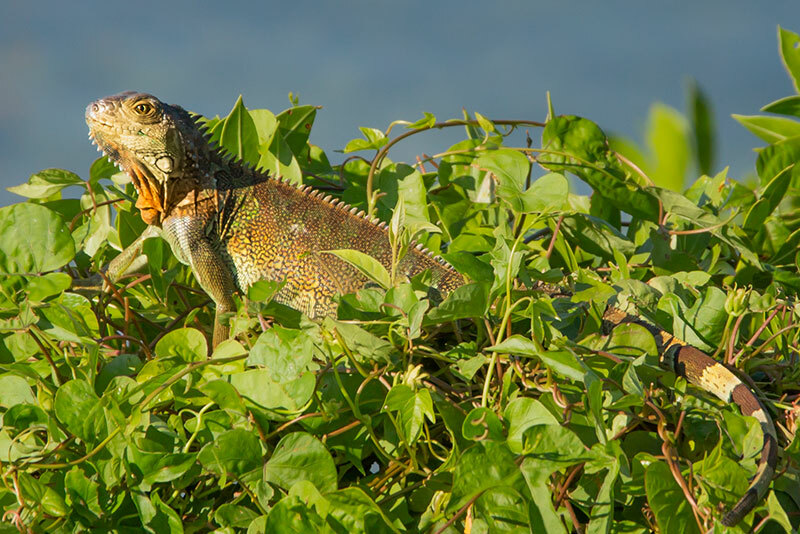 By the way, a ‘mess’ is the official name for a group of iguanas. These are not native to Florida and were originally pets turned loose when they got too large and their biting personality became more apparent. This iguana is fairly brown but some were St Patrick’s Day green. When I parked and walked back to the ‘mess’ of iguanas, just seeing me from a distance would cause them to scatter, very skittish. Loud trucks and cars passing nearby were not a concern as that goes on all day, but a tall gray-haired guy with a camera would send them running for the bushes. Just finished a tour of Sea World with my niece who works there part time. I was surprised at the $92 entry fee per adult. Adding in Disney World, and Epcot, a Florida vacation could cost several thousand dollars for the family of four flying in from the cold. It is clearly directed to family fun and entertainment for the kids, kind of like a giant water circus….. Sea World also does many injured animal rescues each year. From my point of view, it was hard to imagine not just the initial expense of building the very special water facilities, but the ongoing maintenance and upkeep required.